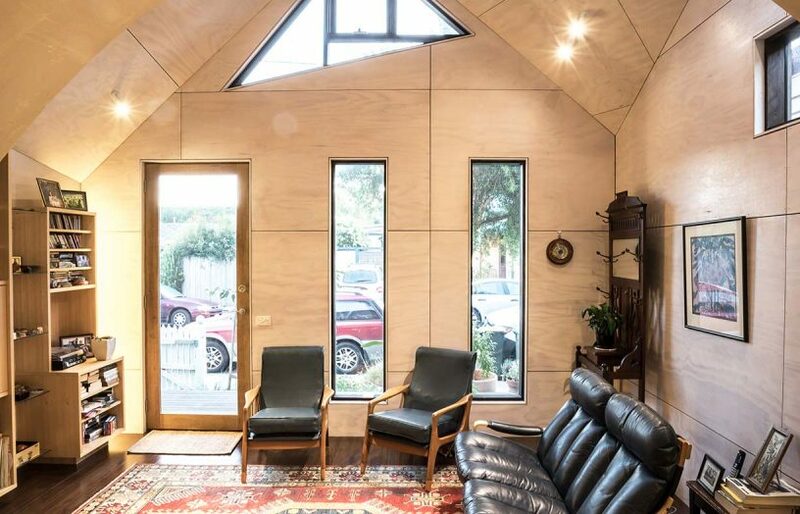 Linda’s house features a gable-end design clad with radial-sawn boards, that’s sympathetic to the character of the neighbourhood. The native garden at the front is growing up to provide just the right level of connection with the street. 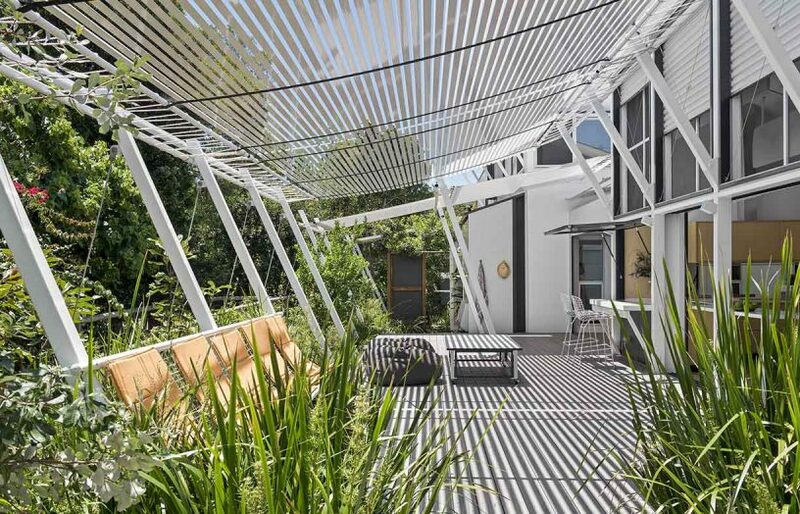 Reversing the room layout and building on the same footprint as the original cottage were key to achieving a spacious, flexible new home that preserves this Melbourne horticulturalist’s beloved inner-city food garden. 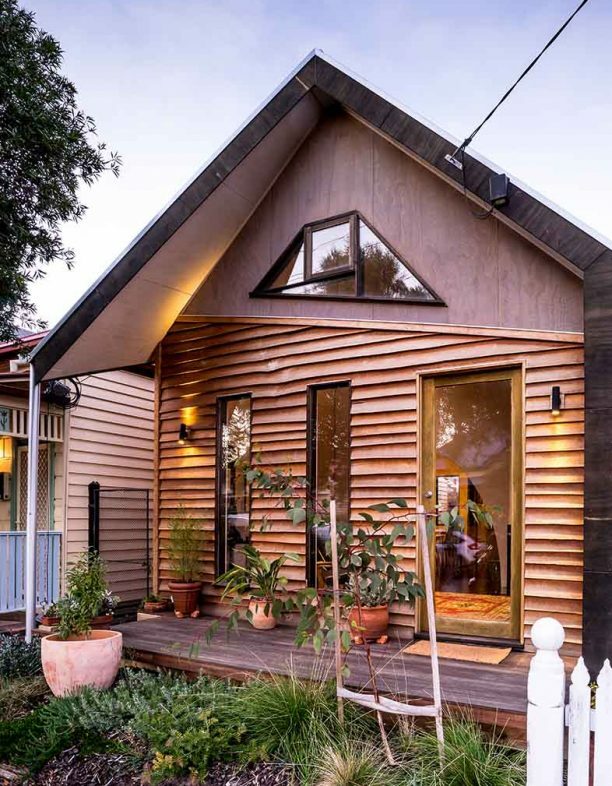 Passers-by on this quiet back street in Melbourne’s Brunswick often stop to comment appreciatively on Linda Day’s little timber-clad house, with its gable-end facade set just a metre or so back from the footpath. It’s a tribute to its deliberate engagement with the street, and a design that is at once sympathetic to the streetscape and yet intriguingly unique. Linda bought the late nineteenth century weatherboard worker’s cottage on this site in 1983, just before the birth of her first son. For two and a half decades it provided a home for the teacher-turned-horticulturalist and her two boys, but as the years passed, Linda started to worry more and more about the structural health of the old house. 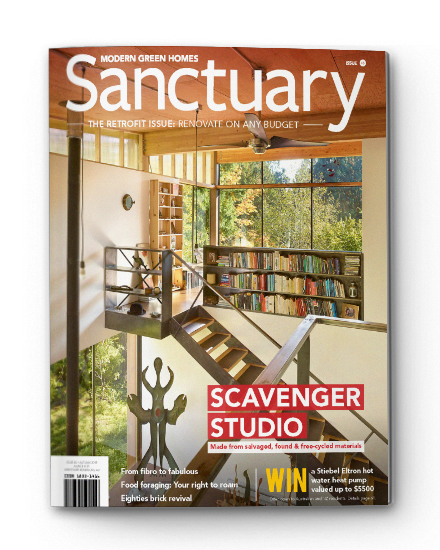 “I found rot in the timber framing behind the hot water service, and after that, every time I put the washing machine on, I waited for the house to fall down,” she remembers. In 2009, now on her own in the house and with access to a small superannuation lump sum, Linda started to think seriously about her next step. She was keen to stay in the neighbourhood she loved and loath to leave her small but well-established food garden. 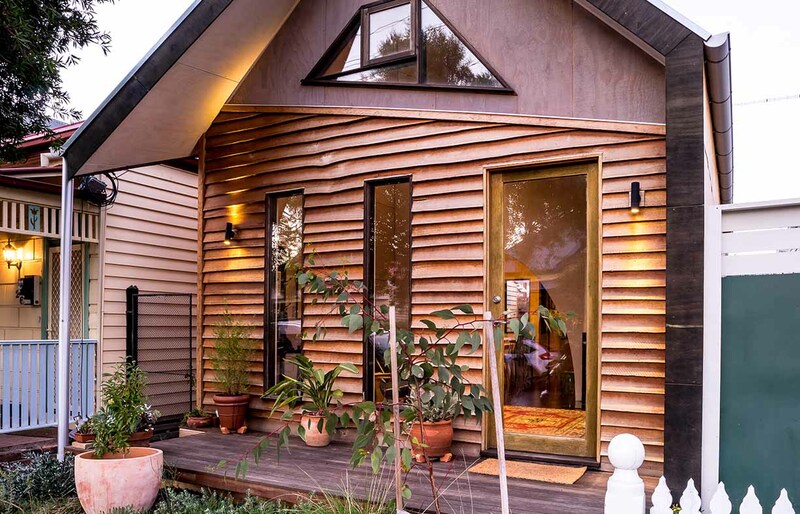 A lucky meeting with sustainable designer Luke Middleton at a permaculture course was the catalyst for her new house. 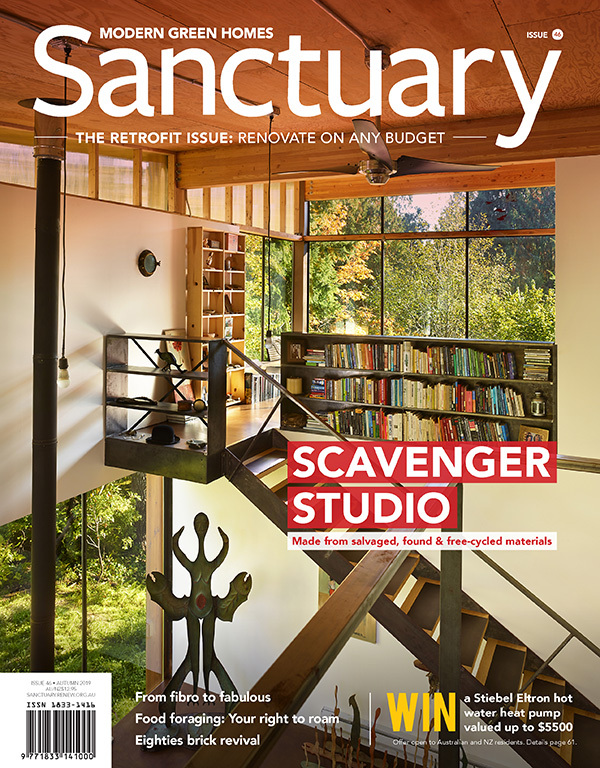 “I would have loved to renovate the old place, but it was too far gone – it was being held together by the paint,” she says ruefully. 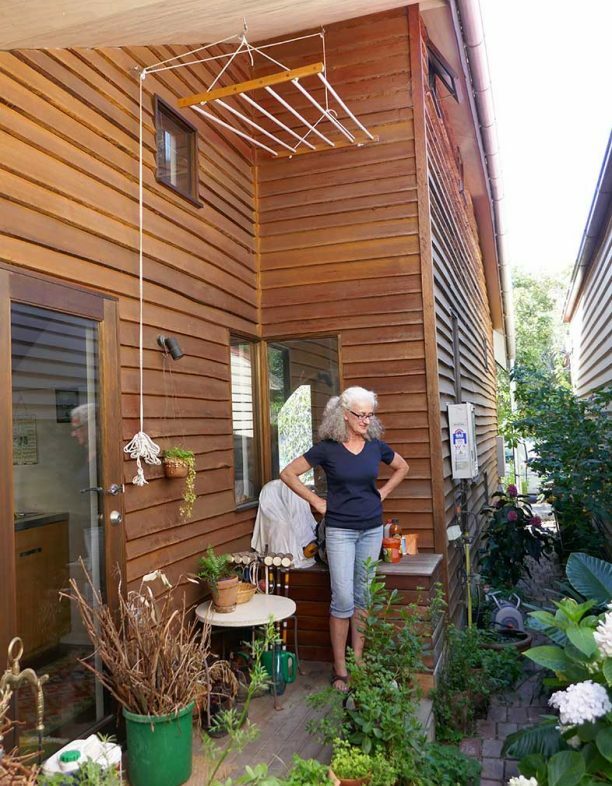 “Luke reassured me that we could create something new that would be beautiful and sustainable, that would not jar with the rest of the street.” And, importantly, be achievable on Linda’s small budget of just $250,000. 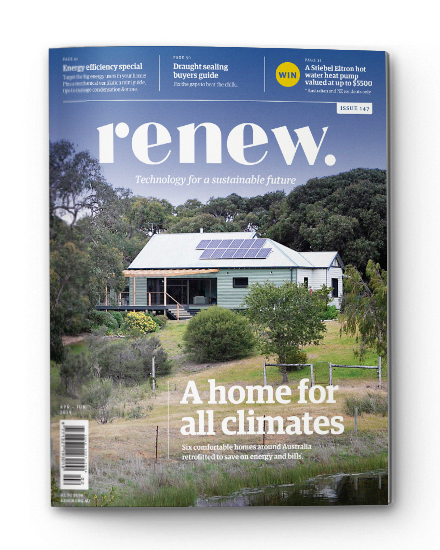 She gave Luke a very broad brief – a sustainable house that was efficient to run, with better organised space, plenty of storage, and that didn’t encroach on the garden. In terms of design, “I had no idea what I wanted; just that I didn’t want a concrete and glass box,” says Linda. 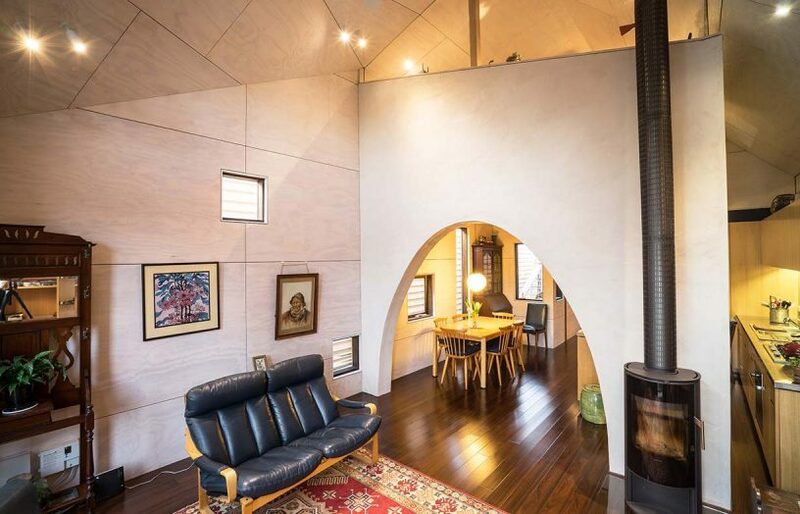 There wasn’t much room to move on the tight 154-square-metre site, so Luke’s design sticks almost exactly to the original footprint, with just a half-metre extension at the back. However, in a moment of design inspiration, the layout was reversed. The old cottage had the typical plan of a narrow corridor going past two bedrooms at the front to a living area and 1970s add-on kitchen and bathroom at the back. 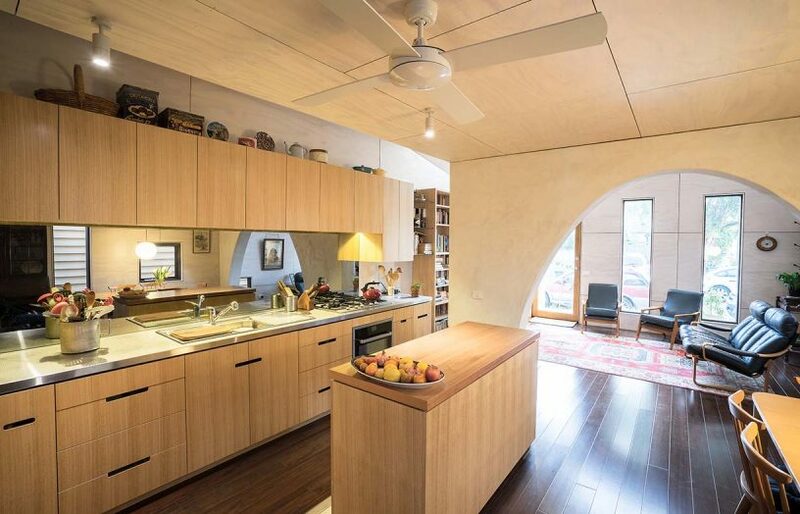 By moving the living space to the front – facing north – and eliminating the corridor, the reimagined house offers a spacious and sunny living room that’s given extra volume with a cathedral ceiling; a sculptural arch in a masonry internal wall (for thermal mass) leads to a functional and flexible kitchen and dining area. Beyond, a linking space leads to the main bedroom at the back which gives access to the bathroom and a side patio. Stairs to a mezzanine room over the kitchen are also located here, with a laundry inserted underneath. An unexpected bonus of the front room is its great acoustics, discovered when Linda hosted regular choir rehearsals for a time. An island bench on wheels enables the kitchen and dining area to be reconfigured to seat a crowd when necessary. “We were inspired by the simple gable-end design of a local weatherboard hall, originally one of the earliest churches in the area,” explains Luke. “That was the launching point for the folded roof form that enabled us to tuck in an upper level without building the more typical double storey ‘wedding cake house on top of a house’. It made sense to move the living room forward, facing the street,” he notes. The material palette was kept simple for both environmental and budget reasons. 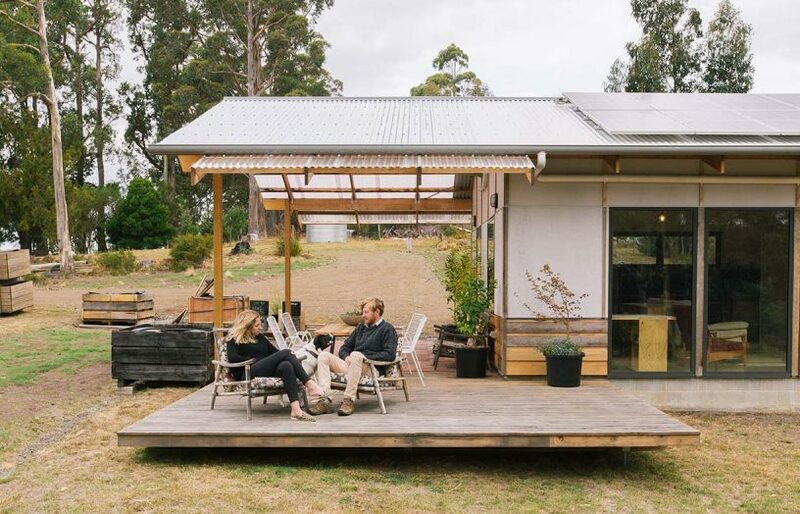 Steel, with its high embodied energy, was avoided; the highly insulated timber frame structure is clad externally with radially sawn weatherboards, and internally with BC-grade plywood sealed with Livos natural oil. All windows are double glazed, and carefully positioned for cross ventilation and night purging of hot air. There is no air conditioning, but Linda says the downstairs stays cool very effectively in summer and opening the mezzanine window and the high south-facing window above the stairs cools the upper level in minutes. In winter, an efficient wood heater in the living room burns the copious prunings from Linda’s gardening business, and she reports that the living space remains “toasty warm” in the mornings with the help of a sliding door at the back of the kitchen for zoning. Linda decided to install a trough and taps (visible in foreground) on her side patio so that it could function as a mud room for both her gardening business and work in her own garden. The patio is one of Linda’s favourite places to sit. 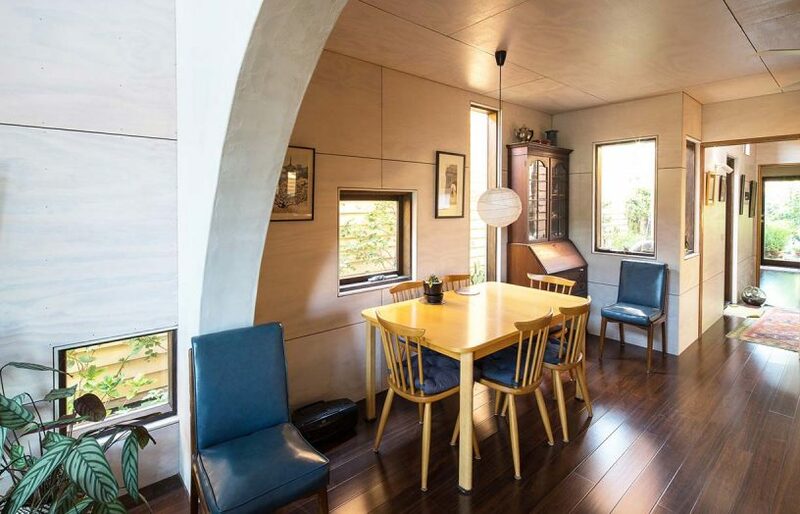 The tall narrow windows and door in the front facade echo the design of an early local church, and admit plenty of northern light into the living room while providing a level of connection with the street. Carefully placed windows in the living and dining areas frame views of the narrow side garden filled with shade-loving plants. They also open to facilitate cross ventilation. One of Linda’s favourite features of the new house is the door that leads straight from her bedroom to her beloved garden. Here, the spaciousness of the interior gives way to crowded greenery, with barely room to move: “I can’t resist a plant,” she laughs. The small space houses 15 fruit trees as well as chooks, a fishpond, vegies and herbs. Even the roof of the little shed is covered with plants in pots. 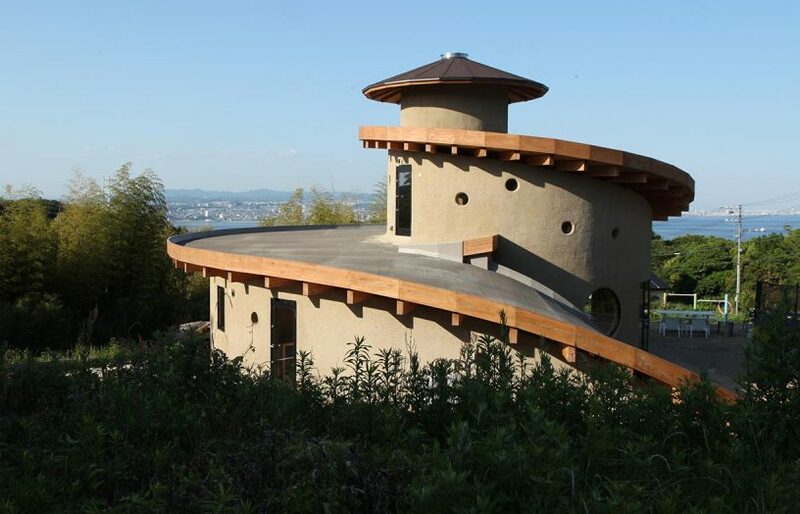 The bedroom roof was kept low to maximise sun access to the garden, which is watered from a 3100-litre rainwater tank that also flushes the toilet.